Alexandra Grablewski / Getty Images. 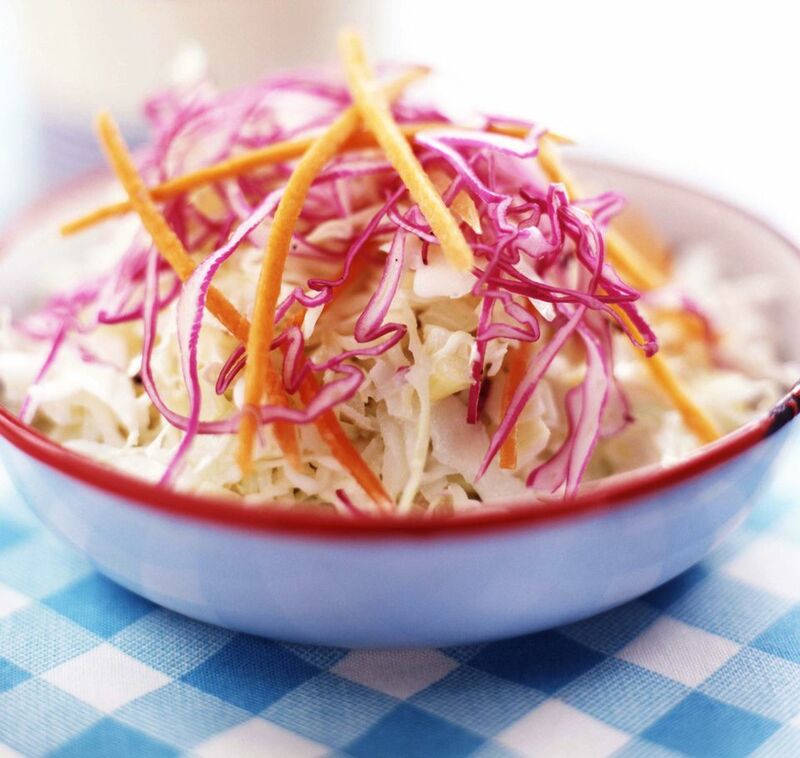 Try this tangy German-style raw slaw recipe next time you're looking for a raw and living foods cabbage salad. Made from fresh raw green cabbage, purple cabbage, carrots, and cold pressed oils, this is a healthy vegetarian, vegan and livings foods recipe, suitable for anyone on a raw food diet, a vegan diet or anyone just trying to eat a diet that is a little healthier and lower in calories. With all-natural ingredients and nothing processed, this simple raw slaw is also gluten-free. In a separate small bowl whisk together the vinegar, mustard, oil, and agave until a creamy dressing forms, and pour over the cabbage and carrots. Enjoy as a side dish or as a snack or light lunch. Cabbage, especially when eaten raw such as in this slaw recipe, is a healthy food. Cabbage is a cruciferous vegetable, which has been found to have cancer-preventive benefits. Different kinds of cabbage have different health benefits, so combining green and purple cabbage in this raw slaw recipe enhances the health benefits. This raw slaw recipe calls for cold pressed oil, which can be higher in nutrients than oils produced with other methods. Using heat to extract oil from seeds, fruits, nuts, and vegetables produces more oil, but this process also degrades the oil's flavors and nutritional value. Cold pressed oil is extracted by crushing the seed or nut and forcing out the oil with a press that does not use heat and allows the nutrients to remain intact.